After spending several days in the French Riviera, walking and meandering along the Sentier du Littoral, Nancy, Frank, John, and I leave Nice, France- via the regional train (TER-Regional Express Train). The four of us are headed northeast to the Italian Riviera. For three and half hours, our train weaves along and through picturesque villages leaving France behind and crossing into Italy at the border-Ventimiglia. Our train makes six+ stops en-route, until we reach our final destination of-Santa Margherita Liguria! We are met by Loredana Pantano , our private tour guide, for the next three days. She greets us with a curtsy, a big hug and kisses for each cheek. As we begin our tour, Loredana gestures and talks with her hands. She is animated and tells stories and historical facts with passion. She is amazing! We will begin our tour in Portofino! Welcome to our journey! It is a short ride up the cliffside to Portofino, where the population is only 500. Portofino is under the flag of Genova, and from our history we know Portofino was liberated by the U.S. on April 25, 1945,or at least that is the date that residents celebrate the liberation. There is a statue depicting a blessing and weeping for Portofino to be saved during WW II. Portofino sits on a peninsula in the Tigullio golf east of Genoa in the northern Italian region of Liguria and is part of the Italian Riviera. Portofino is known to be a playground for the rich and famous; but there is much more to see in this picturesque village with its half-moon shaped harbor and cliff-hanging villas, painted in dreamy pastel colors from vegetable dyes in colors of green and ochre. Cruise ships and Yachts are docked in the bay at Portofino and the village is coming to life. It is a fashionable resort, with narrow streets, colored houses, high-end fashion boutiques, and elegant restaurants and cafes on the waterfront. We begin our walk up to a Baroque style church, San. Giorgio, where the church is dedicated to the Virgin Mary with crucifixes from the 18th century. 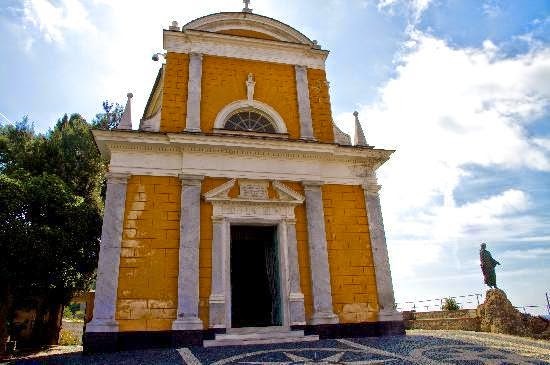 The Church of San Giorgio is a lovely yellow Church that dates back to the 12th century. The Church was completely destroyed during WWII and was rebuilt in the original style in 1950. We continue to a shrine cemetery where many famous writers and poets are buried. We admire bronze statues and beautiful gardens with works of Carrera marble, stone and slate. The marble, stone and slate, depicts wealth and status during the baroque period. Another unique art method is called Risseu… where pebbles are hand in-laid﻿﻿ in front of churches or noble Villas-the style was developed around XVI. We admire the scenery, the natural surroundings, landscapes, and the turquoise sea. The port is known as “Portus Delphini” – the Greeks called the native people of Liguria dolphins. Portofino is said to be the most beautiful port on the Mediterranean. Portofino is postcard perfect! 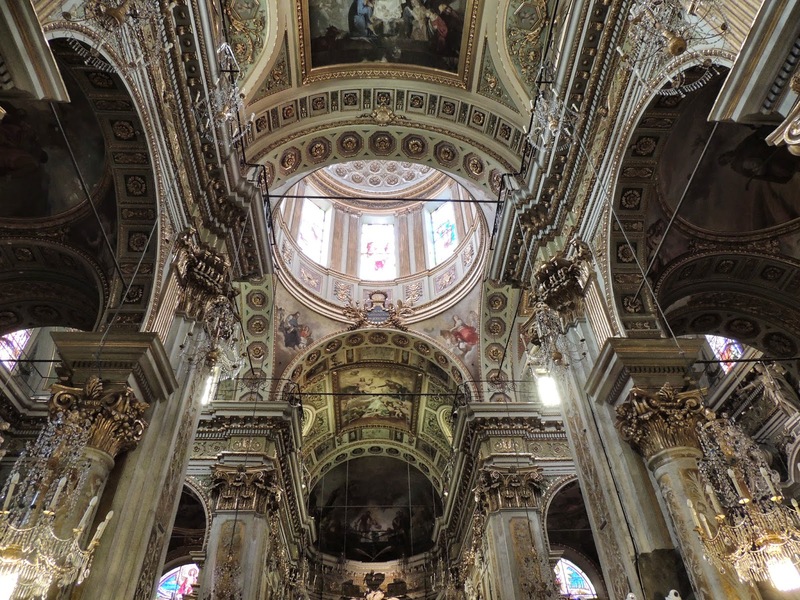 We ride back down the hillside to Santa Margherita and tour the Basilica of Santa Margherita. There is a legend that during renovations, water was discovered with the fragrance of roses...thus the dedication of the Basilica to the Virgin Mary of the Roses. We end our first day in Santa, as the locals say. From Grand Hotel Miramare we can see fireworks across the bay. The celebration is for both the Italian Republic and the Catholic Religious celebration of Corpus Domini, with fireworks and flowers pedals decorating the streets. Stayed tuned for more of this adventure. Falling in love with Santa Margherita Liguria!